August 18th-20th Sail-In Cinema @ Sugar Beach, 25 Dockside Blvd. Toronto’s free, floating festival returns! With this year’s theme of “Books to Big Screen,” movie-goers will have the opportunity to experience – or re-experience – some of their favourite stories in a very unique way. Catch Hook on Thursday, Jumanji on Friday, and the Princess Bride on Saturday. Gates open at 6 pm, screenings start around 8. August 19th-21st TIFF POP 03: VR + Experimental Film @ TIFF Bell Lightbox, 350 King St. W. Although they’ve been around a long time, virtual reality and immersive media have barely begun to be explored as mediums for art. Some incredible work has been created to date; at POP 03, TIFF will show some of the best, and get into the conversation about what’s next. Tickets available online. 7 pm Open Roof Festival @ 99 Sudbury, 99 Sudbury St. This week kicks off with a performance Sam Drysdale, who’s been hailed as a “songwriter to watch” by the Musician’s Institute in Los Angeles. Shortly after, ORF presents the Canadian premiere of My Blind Brother, about a rivalry between two brothers that reaches a fever pitch during a charity swim competition as both vie for the affections of the same woman. Music starts around 8, with the film commencing at 9 pm. $15 tickets available online. 8 pm The MUFF Society Presents: Now & Then @ Carlton Cinema, 20 Carlton St. The MUFF Society is getting nostalgic with Lesli Linka Glatter’s Now & Then, a slumber party staple about friendship, growing up, and buying a motherfucking treehouse! Doors at 8 pm, screening at 9. $10 advance tickets available online. 9 pm Through Space & Time @ Bar Fancy, 1070 Queen St. W. DJ Caff on the ones and twos, playing just about everything in .WAV, mp3, and vinyl form. Dirty nachos and some of the city’s best fried chicken and oysters available, all night long. 5 pm Perfect Strangers @ Thoroughbred, 304 Richmond St. W. Hip-hop, R&B, reggae, new jack swing, and more, with DJ Caff playing everything from bangers and ballads. $5 food and drink special menu in full effect. 8 pm Queen West Night Market @ Queen St. W. between Peter and Palmerston. Hubba has paired up with Toronto’s best independent retailers and a variety of local Toronto-based craft food producers to launch the Queen West Night Market. From 6-8 pm, they’ll be taking over Queen West, inviting people to sample the best craft food and beverage brands that Toronto has to offer, and explore the unique shops. A list of participants can be found here. Free! 8 pm What About Barb? @ The Yukon, 1592 Queen St. W. A night for fans of Stranger Things, particularly the unforgettable character, Barbara Holland. Listen to a Barb-inspired playlist, check out some live Barb-inspired chalk art by some talented local artists, add an entry to Barb’s diary, and even play a song on guitar or do a reading if you’re feeling so moved. 8 pm Seinfeld Super Terrific Happy Hour Trivia @ Unlovable, 1415-B Dundas St. W. In classic pub-style trivia, Super Terrific Happy Hour trivia features intense trivia questions from the entire history of Seinfeld. No multiple choice, no questions out of canon, just straight up question and answer on the world’s favourite show about nothing, brought to you by three undefeated Seinfeld trivia nuts who clearly have too much time on their hands. Teams are up to six people, answering 50 questions over three rounds, and enjoying Seinfeld episodes in between. Win prizes! 3 pm Mad Decent Block Party @ Fort York Garrison Common, 250 Fort York Blvd. America’s biggest block party is back in 2016 with 16 shows in 13 cities this summer, including Toronto! Bishu, Diplo, Grandtheft, Louis The Child, marshmello, NGHTMRE X Slander, Sleepy Tom, and Slushii headline. $46.50 general admission tickets available online. 8 pm Mod vs. Mod @ The Bristol, 1087 Queen St. W. Inviting all fans of scooters, the mod scene, and music to join the Barking Mad and Toronto Scooter clubs at the Bristol pub. Soundtrack to the night provided by DJs Nico (With It, CIUT 89.5 FM’s Vinyl from the Crypt) and Boss Chops (Ram Jam, Knockout). Expect to hear mod, mod revival, northern soul, post-punk, punk, reggae, rocksteady, ska, soul, Britpop, and madchesther from the ’60s-90s! 9 pm Victory Dance @ Track & Field, 860 College St. Indoor bocce, shuffleboard, and crokinole boards throughout the bar. DJ Caff will be playing your victory soundtrack; a mix of throwback R&B and hip-hop, with some dancehall and house thrown in for good measure. 8:30 pm Wayne’s World Quote-Along @ Bloor Hot Docs Cinema, Bloor St. W. Wayne’s World! Party Time! Excellent! Wee-ooh Wee-ooh Wee-ooh! Prepare to be magically whisked away to Aurora, Illinois in 1992: a time when people still watched cable TV, “psycho hose beast” was a popular insult and belting out “Bohemian Rhapsody” in the car with your best friends was everything. The hilarious Thomas Rivas will host and there’ll be subtitles on so you know exactly when to say “WE’RE NOT WORTHY!” Doors at 8:30 pm, screening at 9:30. Advance tickets available online. 10 pm East Coast West Coast @ Studio Bar, 824 Dundas St. W. With the deaths of Tupac and Biggie Smalls came the end of the golden era of hip-hop. Join Whooever and DJ Keen as they celebrate two lives that gave us an incredible catalogue of music, but ended far too soon. They’ll also be playing all the other hits and anthems that served as the soundtrack to this amazing era. $5. 10 pm Rebel Hop @ The Piston, 937 Bloor St. W. Rebel Hop is back for yet another hot summer night of funk, soul, reggae, and hip-hop – music guaranteed to make you sweat. DJ Gramera on the wax, DJ Linx on the Mac, and Dennis P on the sax. 10 pm Dolce Vita @ The Yukon, 1592 Queen St. W. Join DJ Sphinx for a night of groove heavy euro disco and italo dance, with a pinch of ’80s new wave. Featuring music by the likes of Jacno, Savage, Gazebo, The The, Righeira, LA Priest, Ryan Paris, Mike Rogers, Silver Pozzoli, The Electric Connection, and more. 10 pm Under the Influence @ Unlovable, 1415-B Dundas St. W. DJs Wes Allen and Pooyan meet for a special night of deep cuts. Expect soul, funk, psych, and reggae. All vinyl. All good vibes. No hard feelings. 10 pm Renaissance: All ’90s @ DW Alexander, 19 Church St. ALL nineties. ALL Night. Featuring Renaissance resident Mista Jiggz. No cover. 10 pm Person of Interest / Andrew Ross / Graffiti Bruisers @ Bambi’s, 1265 Dundas St. W. Person of Interest (Exotic Dance/L.i.e.s., NYC), Andrew Ross, and Graffiti Bruisers holding it down all night. $10 limited early bird tickets, $15 in advance. 10 pm F*CK Y*U D!E @ The Shop under Parts & Labour, 1566 Queen St. W. DJs Brains4brkfst and Death Cohen. $5. 10:30 pm Booyakasha @ Holy Oak, 1241 Bloor St. W. Wine your body to island sounds! Summer soca, dutty dancehall, and rocksteady riddims. 10 am Toronto Flower Market @ CAMH, 1001 Queen St. W. A market that celebrates locally grown flowers, the growers that cultivate them, and the florists that style them. Discover some of your late summer favourites like lisianthus, zinnia, scabiosa, and strawflower. Until 3 pm. 11 am The Trinity Bellwoods Flea 1 Year Anniversary @ Studio Bar, 824 Dundas St. W. The Trinity Bellwoods Flea is back with a fresh lineup of local artisans and vendors, music, and cocktails to celebrate their one year anniversary! Featuring some of the city’s best in art, collectibles, handmade, fashion, and vintage + a fun and funky mix of all your favorite summertime toe-tapping songs! Until 4 pm. 11 am Zine Dream Small Press Fair @ The Great Hall, 1087 Queen St. W. The ninth annual Zine Dream Small Press Fair is here and will be bigger and better than ever! Featuring over 90 exhibitors of self published art books, comics, crafts, music, zines, and much more. Until 6 pm. PWYC. 2 pm It’s Not U It’s Me @ The Power Plant Contemporary Art Gallery, 231 Queens Quay W. This world class summer party series transforms The Power Plant into a space celebrating the diverse cultures and DIY community spirit of underground dance music with internationally renowned DJs, AV performance art, sculptural installations, and dance floors you can lose yourself in. This is the last one of the summer! Until 3 am. $10-35 advance tickets available online. 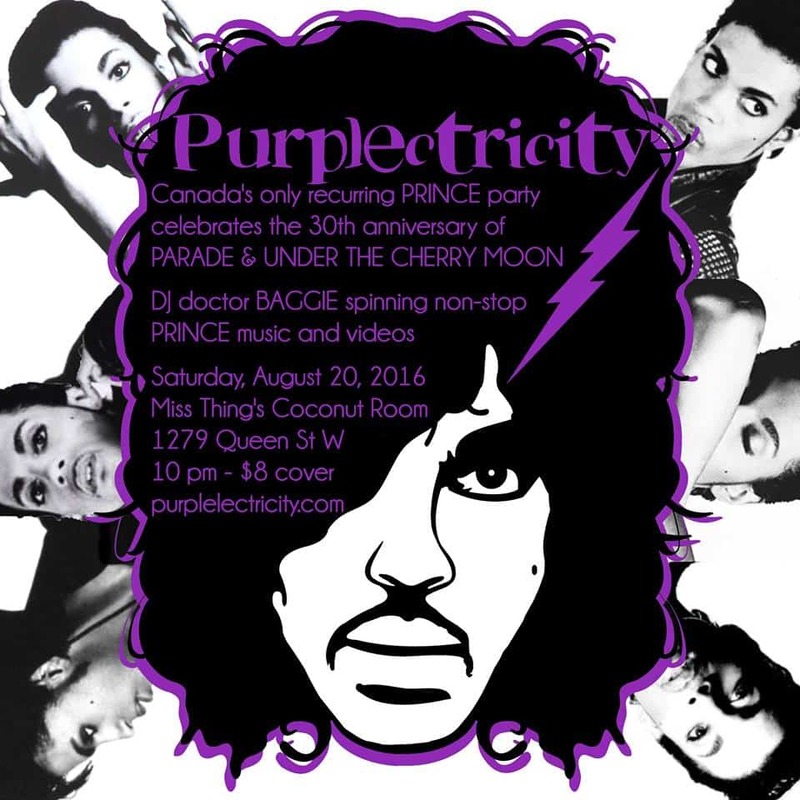 10 pm Purplelectricity @ Miss Thing’s, 1279 Queen St. W. Celebrate the 30th anniversary of Prince’s film Under the Cherry Moon and associated album Parade! This era gave us the classic singles “Kiss,” “Mountains,” “Anotherloverholenyohead,” and “Girls & Boys.” DJ Doctor Baggie will be playing music and videos that span Prince’s entire career, from his 1978 debut For You through 2016. $8. 10 pm It’s All Good @ The Piston, 937 Bloor St. W. DJs Splattermonkey and General Eclectic spin all-90s hip-hop, house, and rock! The best all killer and no filler selections from 1990 to 1999, so expect to hear stuff like Wu-Tang, Pixies, Nirvana, etc. Nostalgic moments guaranteed, because It’s All Good, baby! $5. 10 pm A Sneaky Dee’s Motown Night @ Sneaky Dee’s, 431 College St. Dust off your dance shoes and come twist and shout with Sneaky Dee’s! Featuring all the jams from The Jackson 5, Marvin Gaye, The Temptations, Stevie Wonder, Gladys Knight and The Pips, Diana Ross and The Supremes, The Four Tops, The Marvelettes, and more. $3.50 drinks before midnight. Free before 11:30 pm, $5 after. Advance tickets available online (includes line bypass, guaranteed entry). 10 pm Boosie Fade @ Studio Bar, 824 Dundas St. W. DJ Yung Adult and Jordan Sowunmi are back up in it, this time at Studio Bar. Expect to hear songs and artists like Kodak Black, Thugger Thugger My Brother, Lil Uzi Vert, Super Future, YG, 6 God, Guwop, Bad Gal Riri, and more. $8 before midnight, $10 after. 10 pm All Vinyl Everything @ BLND TGER, 559 College St. No laptops. No Serato. Just turntables and vinyl. Stock up on water, because DJs Mensa, Agile, and Mar Brown are bringing di fire! Style code in effect. Email info@browneyesentertainment.com for guestlist. 10 pm Party & Dance @ Prohibition Gastrohouse, 696 Queen St. E. Pop, dance, and hip-hop throwbacks with DJ Caff. $5. 10 am Yoga in High Park @ 1873 Bloor St. W. (just to the right of the front gates on Bloor near the Chess House). Flow-active is running a FREE summer-long yoga series! The styles will vary week-to-week, but will always accommodate beginners and welcomes people of all ages. This week’s session will be led by Breathe Yoga Studio. BYO: yoga mat, sunscreen, and friends. 5 pm Sunset Sunday @The One Eighty, 55 Bloor St. W., 51st floor. Champagne popsicles, $5 bar cart, specials, giveaways, and the best view for a Toronto sunset. DJ Caff will be mixing house, R&B, hip-hop, pop and reggae, including a healthy amount of summer anthems. 6 pm Christie Pits Film Festival @ Christie Pits Park, 750 Bloor St. W. The Christie Pits Film Festival caps off its sixth summer season with a screening of the 2000 blockbuster Cast Away and Toronto filmmaker Phillip Barker’s tense, atmospheric Dredger. Eats and treats provided by Kung Fu Dog, Pizza in the Pits, and Be Good. BYOBlanket. Free / PWYC ($10 suggested).